As we walked through the high grass, hauling the canary yellow inflatable raft by its handles, I found myself rendered speechless – the kind of mute panic that comes from knowing that in a few minutes I would be going down river, having to negotiate rapids for the first time in my life and that heart-stopping fear was compounded by the sure knowledge that I would be teased forever when my family saw pictures of me in a wetsuit. 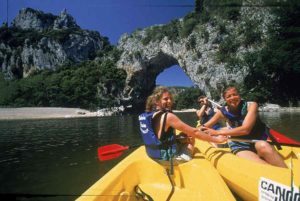 I needn’t have worried about the river and its rapids though, as the descent of the River Lot from Entraygues to Grand Vabre is twenty kilometres of very accessible canoeing and rafting, suitable even for families with children. We meandered our way past steep banks densely forested with chestnut groves on one side and vineyards on the other, and all the while our guide whetted our appetite for lunch by pointing out farms of the many artisan cheese makers that dot the area. Later at Vieillevie, we ate on a wisteria covered terrace that overlooked the river and in the dappled light, in between salivating over a most delicious and languid lunch, we marvelled at the fact that this piece of balmy heaven was just a two hour flight from Dublin. A great part of the Lot valley is made up of the vast volcanic plateau of the Aubrac that rises to 1400 metres above sea level. An area of breathtaking landscapes and big skies, the beauty of the Aubrac lies in being able to see forever – over its endless stretches of prairies and moors that are home to over two thousand species of flowers. It is impossible to drive past fields of narcissus without stopping to get up close and stare in admiration. With pastures clothed with such good looking flowers it is very difficult to resist the resulting uniquely flavoured cheese and charcuterie. Masses of wild thyme, rolling acres of sylvan anemone, violets, gentian, wild tulips, violets, pansies, geraniums and wild orchids accosted us as we hiked a few kilometres across the moorland heading for a ‘burron’, the traditional shepherd’s huts, where we stopped to have our picnic lunch of local bread, cheese and cured sausages. We lingered there, reluctant to leave a place so wild and beautiful, but there were medieval villages and market towns to explore and so we walked on. The hidden villages of the Lot Valley transport you to a timeless rural world, steeped in character and heritage and, they rank amongst the most beautiful villages in France. The authentic architecture of these granite and basalt stone villages with their simple cottages, grand castles, churches and ruins are exceptionally well preserved. We spent time in Salers, a little medieval gem, with cobbled, narrow winding streets and spectacular viewing points from its ramparts. Its small, but bustling, morning market was full of roses and geraniums plants for sale on one end, while the other had a selection of cheese, bread, cold meat and wine to make up a hundred different gourmet picnic lunches. 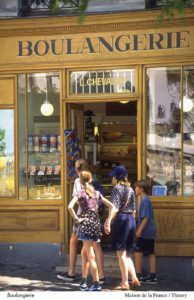 Saint Urcize, Laguiole, Nasbinal, Aumont-Aubrac were equally delightful – it was easy to see why Parisians in the know head to the Lot valley when they want to get away from it all. At the end of spring, the famed Aubrac cattle are prepared to be moved to their higher, summer pastures in the mountains. This ceremonial send off is marked by a huge and colourful festival, the Transhumance, that takes place on St Urban’s Day which falls on the last Sunday in May. Thousands of cows are decorated with ribbons, elaborate headdresses made of flowers, pompoms and bells and then driven with much fanfare to the mountain pastures. The festive atmosphere is complete with shows and displays of local food and wine. A great time to visit if any!